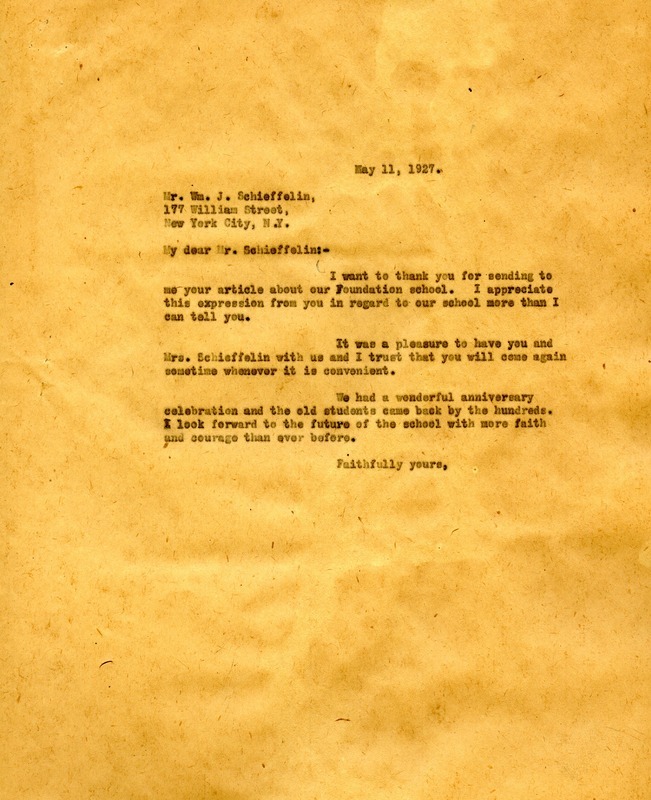 Letter to Mr. Wm J. Schieffelin from Martha Berry thanking him for sending her his article about the Foundation School. She informs him that it was a pleasure to have him and his wife at Berry and she conveys her wishes that they should come again. We informs him that they had a wonderful anniversary celebration where many old student returned and gave her hope for the future of the schools. Martha Berry, “Letter to Mr. Wm J. Schieffelin from Martha Berry.” Martha Berry Digital Archive. Eds. Schlitz, Stephanie A., Haley Fortune , et al. Mount Berry: Berry College, 2012. accessed April 21, 2019, https://mbda.berry.edu/items/show/5540.